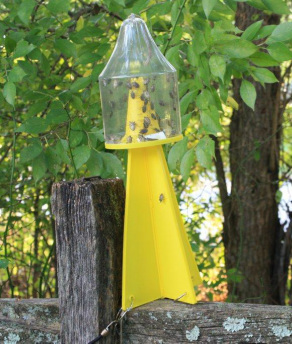 Dead Inn Stink Bug Traps - AgBio, Inc. Check out this video about Stink Bugs! The DEAD-INN Stink Bug Trap uses pheromone technology. The Stink Bug Combo lure is a broad spectrum 7 week lure. It attracts Brown, Brown Marmorated, Consperse, Dusky, Green (Acrosternum), Harlequin, Red Shouldered, and others. The patented DEAD-INN Stink Bug Traps are being used by the USDA, State agencies and Universities where stink bugs are a concern. Place the lure into the trap and place trap outside at least 25ft from your garden, fruit trees, backdoor, etc. The lure will attract 2nd - 5th stage nymphs (immatures) after they hatch from egg masses. 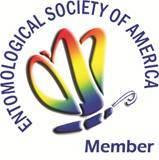 In the mid-Atlantic region, egg laying starts in May/early June. Nymphs do not fly but only walk. To catch nymphs place trap in tree early in season with fins of the pyramid resting on tree or shrub limbs so nymphs can walk into trap. If nymphs can see the trap on the ground they may walk to it. Overwintering adults that emerge in the Spring DO NOT respond to the lure. These adults begin laying eggs in the Spring. Only the NEW generation of adults which develop later in the summer in the mid-Atlantic region are attracted to the lure. To catch these NEW adults best results are seen when the yellow trap is placed off the ground so that it is visible. Placement on a table or fence railing (see picture below) is suggested. No Stink Bugs will respond to the trap indoors, nor will the lure pull/attract stink bugs from indoors to outdoors. The DEAD-INN Stink Bug Trap is 17" tall x 6 1/4" at the base. One 7 week lure can easily catch hundreds of stink bugs. Replacement parts available for all trap sizes. Clear Sticky Trap. Very Limited Attraction of unwanted insects such as lacewings, ladybugs, bees, and other beneficial insects attracted to yellow sticky cards. This is a large 12" x 12" heavy duty card with no-mess adhesive, sticky on both sides, and release paper. Remove release liner by holding onto non-sticky area of card.